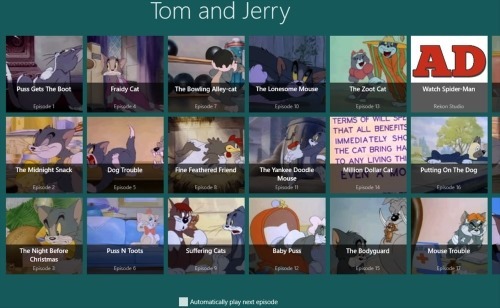 Tom and Jerry lets you watch all your favorite Tom and Jerry episodes, right on your Windows 8 screen. There are approx. 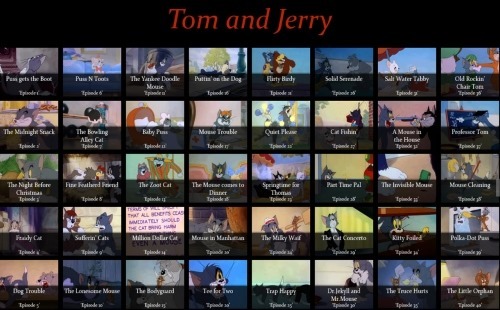 150 different Tom and Jerry episodes that you can easily watch without touching any browser. Although, you will find all these videos on YouTube, however, it’s quite time-consuming to search for each episode. You can easily play, pause, or rewind a video, watch it on full-screen mode, resume the video from where you left off, pin your favorite episode on start screen, loading is very fast, HD video quality and more. As you open the app, you will find a large collection of Tom and Jerry episodes in tile-based form. You just need to click on one in order to watch it. All the videos are in MP4 formats, that brings you superior video and audio quality while preserving battery life. Go ahead and download Tom and Jerry app in Windows 8 now. Watch Tom and Jerry is another popular Windows 8 Tom and Jerry app where you can watch over 150 Tom and Jerry episodes in HD quality. You will not come across advertisements while watching videos. You will control buttons: play, pause, volume, rewind, and forward in the videos. Also, there is an option for automatically playing the next video when currently played one ends. As you open the app, you will find all the episodes in tile-based form and you just need to click on the one you want to watch. To view the thumbnails of all the episodes, you need to use the horizontal scroll bar. Its good fun app for those who are extremely towards tom and Jerry show. Go ahead and download Watch Tom and Jerry app in Windows 8 now. Also, check out our posts on Facebook Client Apps, and Wikipedia Apps. Tom and Jerry Show is again consists of the collection of all your favorite Tom and Jerry episodes. Although, you will find all these episodes on YouTube, but it’s a total waste of time. You head over to YouTube, search for Tom and Jerry videos, do some R&D to find you favorite ones, then finally you watch an episode. But, not any more.. Tom and Jerry Show brings you over 160 best episodes, right on your Windows 8 screen. Go ahead and download Tom and Jerry Show app in Windows 8 now.